This month's newsletter is about two main topics. 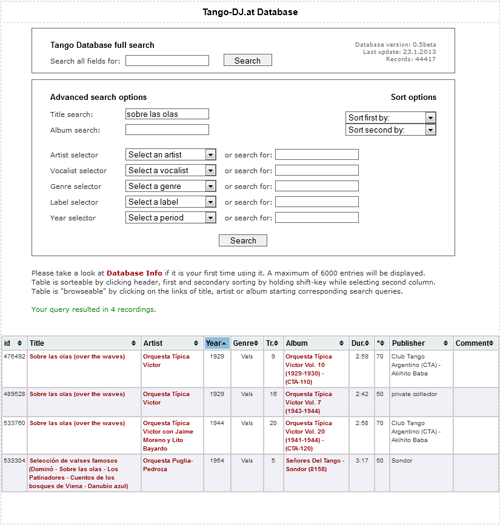 One is the new TANGO-DJ.AT Tango database supporting full date and Unicode characters. The other is about Japanese CDs. First of all about the latest releases of Mr. Akihito Baba under Club Tango Argentino (CTA), but also information about some rare out of print CDs being added as track listings to the catalog and some for sale to the shop as well. You may also find information about an interesting Japanese 10 CD set and the true hobby of Mr. Shigeru Terada, the owner of the music label Audio Park which turns out to be more interesting for Tango DJ-ing than we thought. There you can also find some insider information about possible new releases by Mr. Yasuhiko Fukukawa. Thank you very much for your attention, we hope you enjoy this month's newsletter. We'd very much appreciate your feedback on the content presented. In case you know somebody who might be interested in this newsletter please recommend it or place a link to TANGO-DJ.AT. Unicode support. So special characters of Spanish, Polish, Turkish, Greek, Asian and almost any other languages are supported and should be displayed fine. Please find more information about the available functions on the database information page. As far as the database content is concerned: A big update was done on the recordings of Edgardo Donato and Donato-Zerrillo. With the help of Christoph Lanner plenty of recording dates (mainly between 1929-1932), as well as many other mistakes in titles and artists have been corrected. Please find the updated information by a query for Donato in the database, or using the Edgardo Donato CD-discography page. This database and the information within is provided as it is. Lots of work has still to be done in order to correct mistakes, solve conflicting meta data and unclear information about recording dates, vocalists and much more. In this edition it is all about various Japanese CDs. So please find more information about CDs of Club Tango Argentino, Audio Park, AMP and a quite interesting 10 CDs set called "Este Es El Tango Porteño". First of all we will take a look at the latest new CTA releases. On the website you can listen to a soundsample for each of them. There are two new CDs adding to existing series; Francisco Lomuto Vol. 6 (1934-1935) and Ángel D'Agostino Vol. 5 (1945). On the Lomuto CD there are plenty of rare and nice recordings and there is not one track I would consider being better on another release. The same is true for the D'Agostino CD featureing plenty of recordings in best quality - especially if you are looking for natural sound characteristics in the transfers. Then there is another interesting one - Alberto Gómez Vol. 1 (1929-1935). On that one you will find absolutely rare and unknown recordings. About half of them with guitarras not suitable for milonga use, the other half with orchestra. From those with orchestra you will be able to compile an absolutely unknown tanda of nice and danceable tango recordings sung by Alberto Gómez. All three new releases are available at TANGO-DJ.AT/shop for 39,- EUR each. Following three new releases will be published in May 2013. Most likely they will be available on TANGO-DJ.AT/SHOP in June. As most of you know, there are plenty of CTA CDs which can not be ordered any more. Some of those went "out-of-print" just recently, some can be found being offered in some second hand shops or from collectors in Tokio or Buenos Aires and some can not be found no matter where. It is said that some of the CDs were produced in very small numbers - as few as 80 pieces only. And knowing that there is hardly any interest in Milongas or Valses in Japan I do believe that two of the most sought after CTA CDs belong definitely to those CDs. 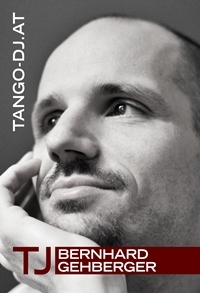 We consider them to be most likely the most important, famous and most copied private released Tango CDs worldwide. It is CTA-1051 Todo Milonga - Serie para baile Vol. 1 and CTA-1052 Todo Vals - Serie para baile Vol. 2 both featuring Milongas and Valses by Francisco Canaro only. We heard stories about those CDs before knowing anything about CTA or Akihito Baba-san. Since then we tried to get hold of those CDs as originals and it became an exhausting quest of more than 4 years chasing contacts all over the world. We think we do not have to point out how happy we are to have those famous CDs as originals! And there is also great news for you - actually one of you: We do have a second original CTA-1052! We have yet to decided if we will offer that one for sale and how. Probably we will publish our decision of how to proceed with that very special CD in our next newsletter. For now, since this was a small collection of CTA-CDs there are also some other CDs we are able to offer to you. Please find some "out-of-print" CTA-CDs being added to TANGO-DJ.AT/SHOP within the next upcoming days! There are two topics regarding the label Audio Park. One is about future releases. I was informed by Audio Park as well as from Mr. Yasuhiko Fukukawa personally. Mr. Shigeru Terada, president of Audio Park met with Mr. Yasuhiko Fukukawa, producer of the outstanding Época de oro - Juan D'Arienzo CD series, discussing possible future CD releases. There might be two new CDs of Juan D'Arienzo including Milongas and Valses as supplement to the existing 11 albums. And another 2 CDs of recordings of Francisco Canaro from 1927 sourced form the collections of Mr. Iwasaki being released as homage to Mr. Iwasaki. The other topic is about the passion of Audio Park president Shigeru Terada. During our meeting in Tokio he explained his interest in collecting old jazz and blues 78 rpm records. Actually about half of all albums released by Audio Park are transfers of old jazz and blues 78 rpm records in outstanding quality. Being curious we got 5 sample albums. You can find the covers and track listings of those on the Audio Park catalog page. This album is now on sale on TANGO-DJ.AT/shop for 32,- EUR. Meanwhile we have received the whole Audio Park collection of 78 albums of old jazz and blues 78 rpm record transfers. We will publish the track listings of those in the near future. You might want to check them out in case you find the above album interesting! As part of the CD bring along from Tokio there is this interesting 10 CD set called "Este Es El Tango Porteño". It turned out to be one of the most challenging CDs we ever had to tag. All the information is given in Japanese only, as you can see on the scans of the back covers. At this point we want to say a big thank you to Matthias helping us with translating the artists and titles of those 10 CDs. But all of you knowing a little about Japanese will understand that it is very difficult to translate back artist names and song titles from Japanese to Spanish. Especially if the translators are German native speakers and hardly capable of Spanish.. It took us a full week of working and researching in order to identify almost all of the tracks and their artists. Some of this was comparable with detective work. It also did not help that those CDs are completely mixed compilations. This recording is available on various CDs. But the transfers on those CDs have either reverb added (Reliquias), or sound dull in general. Whereas this transfer sounds clear as a brand new studio recording. 18. El choclo - Quinteto Pirincho dir. Francisco Canaro - 1:47 - 1961 - Tango - Grabado en el Kojimachi Studio del sello Angel (Tokio, Japón). 04. Canaro en París - Orquesta Francisco Canaro - 2:32 - 1961 - Tango - Grabado en el Kojimachi Studio del sello Angel (Tokio, Japón). 13. Yira... Yira... - Orquesta Francisco Canaro con Ernesto Herrera - 3:21 - 1961 - Tango - Grabado en el Kojimachi Studio del sello Angel (Tokio, Japón). 05. Sentimiento gaucho - Orquesta Francisco Canaro - 2:49 - 1961 - Tango - Grabado en el Kojimachi Studio del sello Angel (Tokio, Japón). 15. Corazón de oro - Orquesta Francisco Canaro con coro - 4:07 - 1961 - Vals - Grabado en el Kojimachi Studio del sello Angel (Tokio, Japón). 19. Quejas de bandoneón - Orquesta Francisco Canaro - 2:58 - 1961 - Tango - Grabado en el Kojimachi Studio del sello Angel (Tokio, Japón). We were able to get hold of a small batch of "out-of-print" AMP CDs and add their covers and track listings to the AMP catalog page. None of them are for sale, but we do receive "out-of-print" AMP CDs now and then. We will inform you of any available for sale on TANGO-DJ.AT/SHOP. Murat and Michelle improvising in Yolatango Austin, 2012 "dancing in small space"